The 4th of July, for me, has always been an underachieving holiday. It has such promise: for starters, anything that calls for setting off fireworks is already headed in the right direction. Plus there's the promise of a cookout, you know, some fried chicken, deviled eggs and watermelon ...sounds great. Just as the French Revolution was in many ways a knockoff of the American Revolution, La Fete Nationale (it's not called Bastille Day here; I'm guessing it's because the good intentions of the Revolution turned pretty darn ugly, and they don't want to commemorate that) is a lot like Independence Day. Free concerts, games for the kiddees... and filthy hot. One of the few advantages of living in a new city where you have no friends is that you have no social obligations to go to anyone's cookout or schlep to someone's Super-Sekrit Fireworks Spot. So we spent the heat of the day huddled around the Pinguino (our trusty air conditioner). 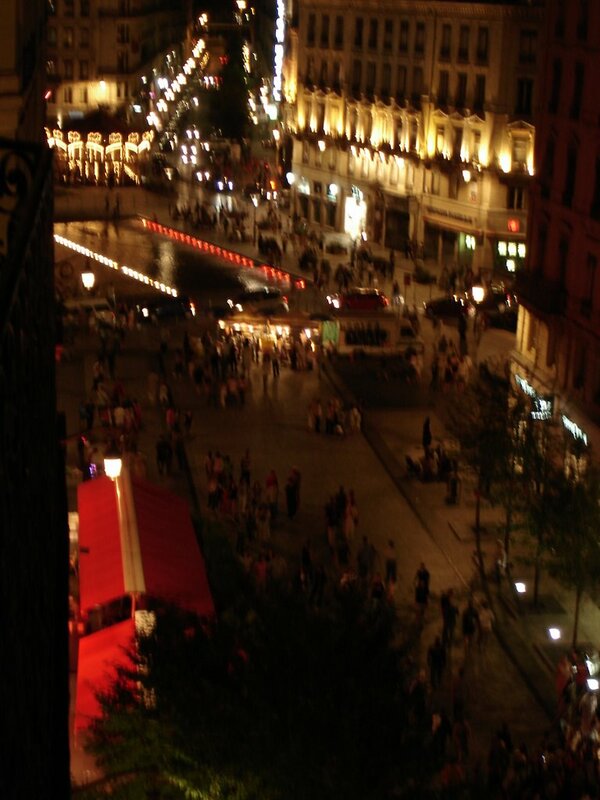 'Round about 10PM--high latitude, it gets dark late here--I gathered up Boog and we walked 3 blocks to the quai along the Saone. 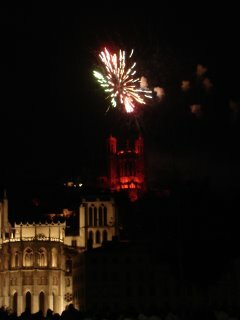 The city's fireworks display is launched off Fourviere, the big hill with the cathedral that dominates the center of town, so you can see pretty well from about anywhere, and the riverside gives a nice unobstructed view. So here are some pictures. 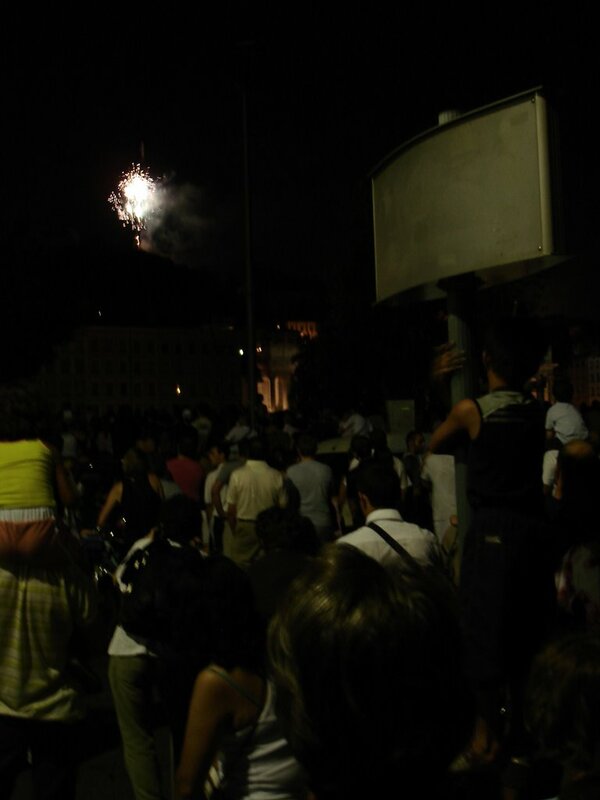 I don't know where French people go to buy fireworks--South Carolina's a long haul from here--but they obviously do, because they were going off all night. This last picture's from our balcony (a perspective you're probably getting tired of), around midnight; note that they've changed the color of the lights in the fountain to blue-white-and-red for the occasion. So is it hot where you are?